3) How do i organize my work with Fasmlab (part 1). Let us play with a bit of professional Explorer-Like graphic !! the first releases will be in a couple of weeks and with very few but robust features. it is on hg repository. to pack it for Windows in a DLL and export a couple of functions to instantiate it etc. you think it is useful to program it to act as a COM too. but that's not a requirement for x64lab. 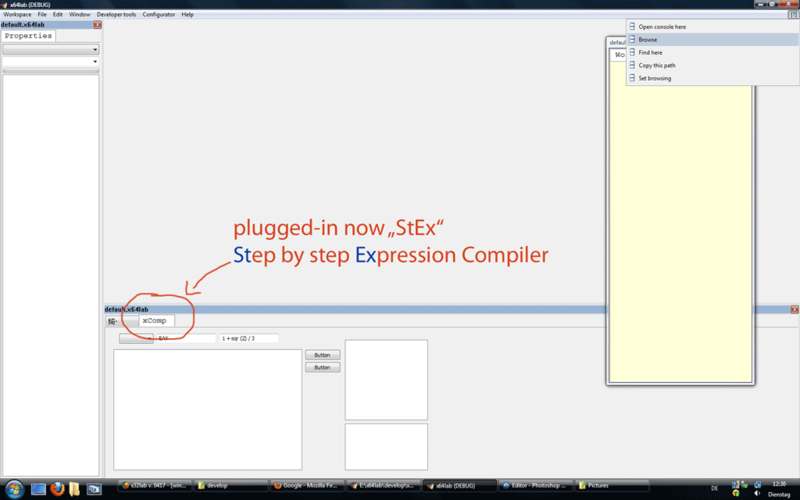 an application,or coding it to be embedded as plug-in in x64lab is done in almost the same time. neverthless it has lot of assembly stuff in alive, and kicking now! ... more to come and simple guidelines on languages. +MNU "Developer tools"|"Add a new Group label"
+MNU "Developer tools"|"Manage tools file (expert user)"
+MNU "Developer tools"|"Browse to add new tool"
- version 0.0.118 (released on 27.08.2012 ) " ... "
+GUI Properties windows renamed to "Multipurpose"
+BEH menu "Developer Tools"|"Add new Tool"
Open Documents not included in the Workspace. Instructional video. 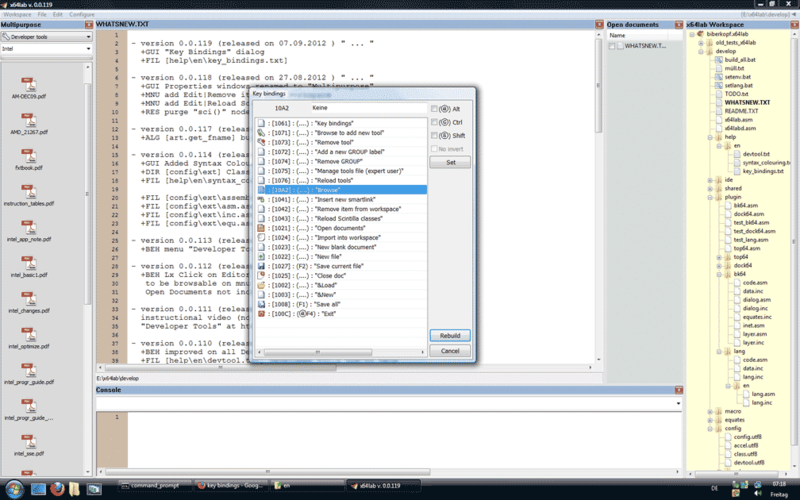 Compile a snippet with fasm and set it as tool. +FIL [config\docking.bin] must be there, for now. +GUI Save position of dock/float windows. test-phase. - version 0.0.119 (released on 07.09.2012 ) " ... "
this is a pre-beta !! out there. not bad, but to be improved. it requires a line in the [ext\classfile.utf8] see synthax colouring or example from assembly class. +GUI modified [MP_PATH\Browse] using "explorer /e,path"
to allow commandline paras and flags. auto reconfiguration. with your preferite editor or using x64lab itself. "Editor Panel", while keeping the rest unchanged. translation has been assigned/done already. require your help on translation. entering mantainance mode 24 hours. Hi forumers, dont be scared ! Help us translating languages. Please follow description in the above post. 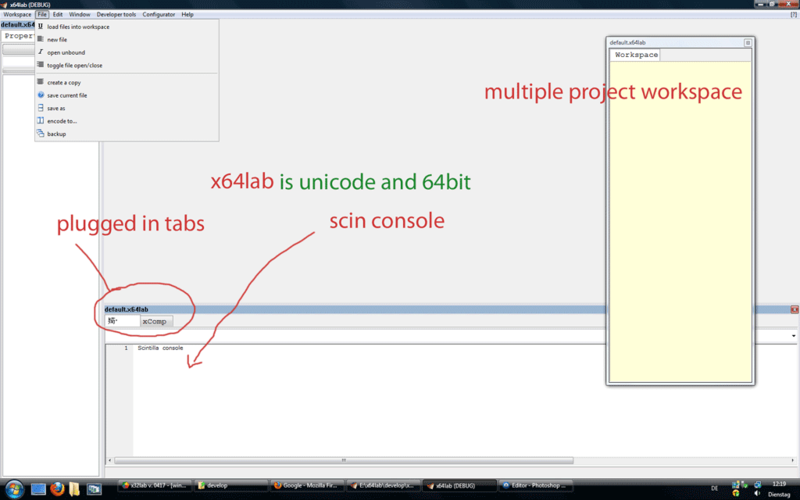 join x64lab. it's funny !